Our most iconic bike is 25 years old. 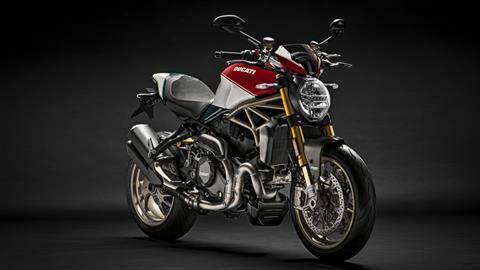 To celebrate, we've created the Monster 1200 25°Anniversario: a numbered edition limited to only 500 motorcycles. 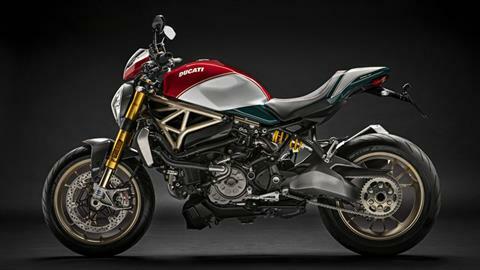 ADJUSTABLE SEAT: The Monster 1200 25° Anniversario is fitted with an adjustable seat (± 25 mm) that can adapt to the needs of riders all over the world. The standard seat height can easily be adjusted to the lowest (795 mm) or highest (820 mm) positions. 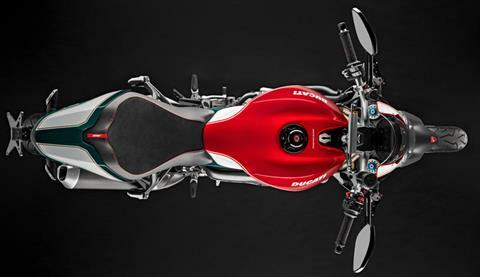 SINGLE-SIDED SWINGARM: The Monster 1200 25° Anniversario features a strong die-cast aluminium single-sided swingarm that ensures high rigidity, low weight, and excellent stability, providing also a technical and professional look. SUSPENSION: The Monster 1200 25° Anniversario has a fully adjustable 48 mm diameter Öhlins fork front suspension. BRAKING SYSTEM: A single 245 mm diameter disc at the rear on which a single Brembo calliper acts, equipped with pads with sintered friction material to increase efficiency. This component ensures the most highly performing brake system in the sector, a trait which has always been characteristic of all Ducati bikes. DUCATI SAFETY PACK (DSP): The Monster 1200 25° Anniversario, in both the standard version and the S version, is equipped with the Ducati Safety Pack (DSP) which, thanks to the Bosch Inertial Measurement Unit (IMU) integrates the Bosch 9.1 MP Cornering ABS, the Ducati Traction Control (DTC) and the Ducati Wheelie Control (DWC) which contribute to highlighting the dynamic performance, optimising control and offering high levels of safety. HEADLIGHT: It has been completely redesigned for this bike and is now equipped with a double parabola and, on the Monster 1200 25° Anniversario, also DRL (Day Time Running Light). Adopting this headlight has allowed a different dashboard mount to be implemented, which is now fixed to the handlebar riser. This gives the bike a visually lighter front part also thanks to the repositioning of the turn indicators, LED indicators for the S version, which are now mounted below the steering head and no longer to the headlight. TFT INSTRUMENT PANEL: The Monster 1200 25° Anniversario dashboard has a last generation TFT colour display. DUCATI QUICK SHIFT: The Monster 1200 25° Anniversario is equipped as standard with Ducati Quick Shift (DQS) up/down, an electronic system originating from racing bikes which allows the rider to shift to a higher gear without using the clutch or closing the throttle and without using the clutch but just with the throttle closed when shifting down. TESTASTRETTA 11°: The 1198 Testastretta 11° DS breathes through the Ride-by-Wire Mikuni throttle body with oval cross-section with a diameter of 56 mm with two spark plugs for each head: the double flame front ensure combustion is completed extremely quickly which, together with the secondary air system optimising operation and reducing cyclical dispersion of the combustion without any impact on pollutant emissions, translates into a more regular distribution providing a more pleasurable and exciting riding sensation. Great attention was paid to improving engine response in terms of modulating the engine response times to the actions on the accelerator. POWER AND TORQUE: Thanks to the throttle body and the dedicated exhaust, the second generation Testastretta 11° DS engine generates a power which can be compared with that of a 3/4 cylinder engine and is able to reach even greater performance levels. EXHAUST SYSTEM: The engine management system dedicates a lambda probe to each header, providing precise fueling, while the stylish cannon-style, vertically stacked silencers carry catalytic converters to provide Euro 3 conformity. An electronically controlled mid-section valve optimises exhaust pressure throughout the rev-range. RIDE-BY-WIRE: The twistgrip does not have a throttle cable connected directly to the throttle body butterflies, but instead delivers a signal to a control unit, which in turn operates an electronically controlled butterfly. The RbW system uses three different mappings to regulate power delivery: 145hp with a sports-type delivery, 145hp with a progressive delivery suitable for touring, 100hp with a progressive delivery for city use. 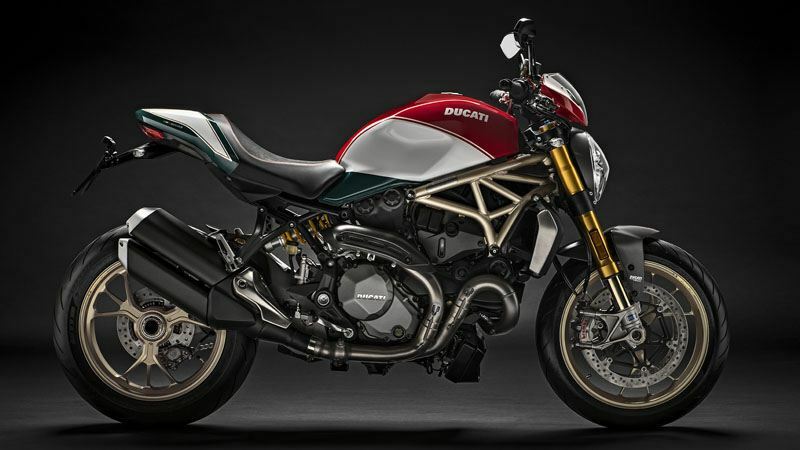 CARBON PARTS: The Monster 1200 25th Anniversario is embellished with numerous billet aluminium details like mirrors, frame plugs, handlebar counterweights and the tank cap, the latter supplied as standard. Also in aluminium are the articulated brake and clutch levers and the number plate holder, while the front and rear mudguards, the belt covers and the exhaust heat guard are made of carbon fibre. FORGED RIMS: The Marchesini rims of the Monster 1200 25th Anniversario are forged with W spokes in the same colour as the livery. STEERING DAMPERS: The steel tube trellis frame and the aluminium single-sided swinging arm are combined with a fork with 48 mm diameter stems and rear shock absorber both from Öhlins and fully adjustable, and a steering damper that was also produced by the famous Swedish manufacturer. DEDICATED LIVERY AND SEAT: The Monster 1200 25th Anniversario features a three-colour Italian flag livery on its headlight fairing, tank and passenger seat cover that is inspired by the Monster S4RS Testastretta Tricolore from 2008. The special livery matches perfectly with the precious seat and its embroidered logo celebrating the bike's 25 years. Front - Marchesini forged alloy, W-shaped 3-spoke, 3,5 x 17 in. Rear - Marchesini forged alloy, W-shaped 3-spoke, 6,0 x 17 in.